This week I have worked on one of the major power-ups in our game – the steampunk armour. The player can find the armour standing around in the mansion, and when picked up, the player puts it on and continues the game wearing the armour. This creates the need for a second set of player animations, where the character wears the armour, which is what I've been working on. 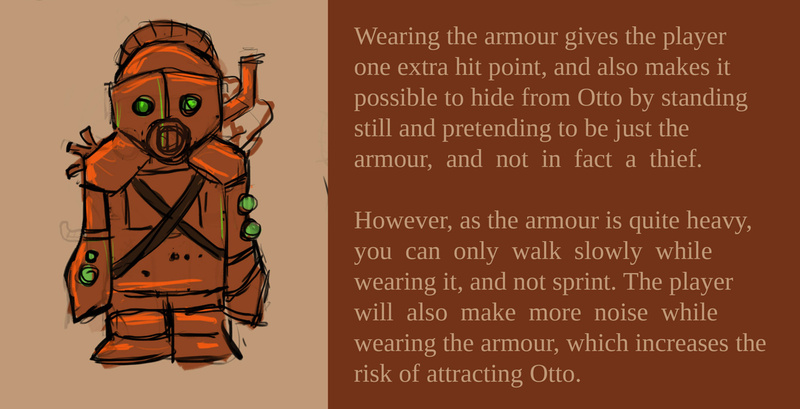 As the armor was one of the most interesting power-ups that were described in the concept document, I started concepting it already in the beginning of the course (see image above). I used one of those old sketches as a reference when I started making the animation this week. As all the props in the game are pictured from a full front perspective, I started by making a front view picture of the armour as well, in order to get an object that the player can find and equip. After that, I started working on the animation of the armour – this time from the side. We want a steampunk style for our game, so therefore a lot of references for steampunk stuff were used in the design process of this armour. The brass colour that we use for a lot of things in the game (including Otto's shell) is actually based on the same early sketch that I used as reference this week. The colour was chosen in order to be childish and playful hence the brightness and saturation, but to also match the steampunk brass theme. This hopefully makes the armour less scary-looking for our target audience (kids), and fits it into the steampunk style. To further steampunk-ify it, I added some green lamps, a pipe, and leather details. The finished armour ended up looking almost exactly like the concept sketch of the armour. Now to the actual making of the armour! One of the most important things to think about was to make sure the armour looks like the caracter could fit inside it. I used a sprite for the thief character and painted the armour on top of that, but on a new layer (line art and colour on different layers). As the armour is made partly out of brass, it would not allow our character to use the same sneaky, hunched-over walking style that he usually does. Instead, I needed the walk to be a lot more stiff, with a straight back. To illustrate this best, the character has only two different leg positions. To avoid the problem of animating a tail in armour, and also in order to achieve a more comical effect that appeals to kids, I decided to let the tail stick out of the armour, and sway along as the character walks. The armour comes in two variations - one with the lamps working, and one with the lamps not working in order to illustrate HP damage after one hit from Otto. As the working lamps are bright green which is a contrasting colour to orange, the change in HP would hopefully be easy to read for the player. A very clear and concise blog post, in my opinion. Your goal, process and reasoning behind each decision is pretty clear. Good job on clear communicating, yay! Content wise I have a couple of suggestions and/or questions. Overall the animation is super cute and you really managed to get the heavy look going. I am especially loving the lil' tail sticking out! Going into things to improve, the arm closest to the viewer is behaving a bit strange in my opinion, going forward with every step. I just tried walking while having one of my arms go forward for every step I took and had to try pretty hard to keep it up. I get that the thief may walk differently due to heavy armor but to me the armor didn't communicate a reason for the arm to behave like it does. It could be easily fixed though, I think! By letting the arm closest to viewer fall back when the leg closest to viewer is rising to take a step. In the same frame, you could also let the back arm appear from behind the armor, since it is in it's top position at that time, giving your character some depth in the z axis. On the super nitpicky side. I see that the front view have some spikes and tubes and wires and whatnot on the side of the armor, but the walk animation has lost these details. I get that some of them are not visible from the side, but the shoulder spikes should definitely be visible from the left side, no? This is a pretty small detail though, just figured I'd mention it. Other than that, I am a bit confused about the armor design wise. Does the player die if they take damage when the lights are turned off? Does that mean that the lights of the armor acts as armor, rather than the armor itself? If I were to pick up armor, I'd expect the armor to protect me from a shotgun shell, rather than the pretty lights on the armor. I am also wondering just what happens to the player after taking a hit, do they get to run away somehow? How do they do that if they are so slow due to armor? I have so many unrelevant questions! Overall great blogpost with some really nice looking artefacts in my opinion. Keep up the good work!